The Xiphos electrical cable reel dispenser and spooler is ideal for electricians and linesmen, acting as a great tool for dispensing reels of wire, cable & sleeving. With a dispensing length of 600mm and maximum cable drum dispenser diameter is 350mm, this cable reel holder will hold up to a maximum of six reels of cable. It also has a massive 50kg carrying load so is perfect for use with all twin & earth cable, singles & flexes. 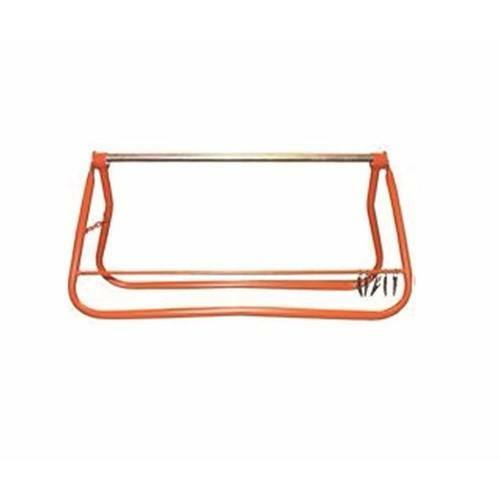 Light Weight cable reel stand enables you to run cables single handed and carry cables easily. Large non slip feet and additional chain support enables safe operation. The cable reel stand is manufactured from tubular steel with an epoxy paint finish (rust and corrosion resistant). It folds flat in seconds for storage and will fit in all sizes of vans and cars. A great time & cost saving product ideal for any electrician in all work environments including bench top, in vehicle and site work. The electrical cable reel dispenser comes complete with 1 years manufacturers warranty. Products which go perfectly with this cable dispenser: CK Cable cutting tool, CK Wire Strippers, CK Plier Set. I should have bought this a long time ago! This now sits in my van come rain, wind and snow! I wouldnt be without this valuable piece of kit! Hello, will this stand support a roll of 1.5 swa? Electrical World Replies: This stand will support up to 50 kg, the height of the ground may be an issue as Swa generally comes on drums which are pretty tall. The max cable drum diameter is 350mm. We have other cable dispensers which maybe idea if also for you. If you put cable reeling into the search box of our website.